Disconnect from all the gadgets and truly connect with the earth in one of the most spectacular places on earth - Yosemite National Forest. This is not your typical retreat, the star-filled sky will be our ceiling and the soft ground will be our beds. Join us for this 6-night/5-day stay in Yosemite’s backcountry and reconnect, rejuvenate and relax. Expert guides will lead us on a hike into Yosemite’s backcountry (approx. 6.6 miles)***, help set up our base camp, keep us safe and prepare organic, gourmet meals for us daily. 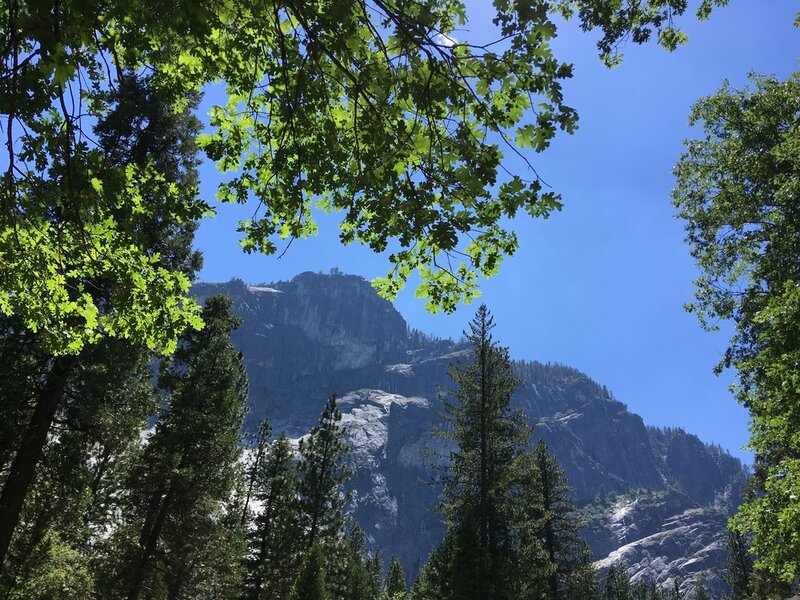 We will then have time to do yoga (lead by Rhiannon), swim, day hike, journal, nap, bond with one another and the earth, get back to the basics of life, relax and take in the natural beauty that is Yosemite. We will return to our beloved concrete jungle with a new appreciation for and a renewed connection with our Mother Earth. ***Due to unpredictability of weather conditions/road closures, etc. of the great outdoors, exact hiking trail and camping spot are subject to change. - 1 Professional wilderness guide + an assistant that will filter your water (from the nearby stream), cook you 3 organic meals per day, lead you on day hikes and explorations in Yosemite, make sure you always have a fire to sit by, provide education on the indigenous plants/trees and wildlife in your surroundings. They will also lead you in best practices in camping and enjoying nature without leaving a footprint to allow you to enjoy yourself and help to keep you safe. - Basic medical care/supplies, emergency communication, & the Yosemite park camping permits and all park associated fees. $500 non-refundable deposit to save your spot*. Full Payments due by July 31, 2019. * Ask about our flexible payment plans! *Limited space available. More than 60 days prior = partial refund of 1/2 the total balance (within 30 days of date of purchase). 60 days or less = NO refunds. If the trip is cancelled by TULA, refunds will be given within 30 days of date of cancellation notice. "I felt that this trip was one of the most amazing experiences i've ever had! ! love hiking and yoga but i've never camped before and ! It was so empowering to challenge myself and push myself to do something new, i got to know a group of inspiring people and it was really fantastic and something i'll never forget- thank you for making this possible it was so special!" "This was the best trip I've taken thus far. It allowed me to spend time with myself and reset. The beautiful, breathtaking views left me speechless and made me more conscious of how precious our world is and how we really need to take better care of it." "Yosemite is such a spiritual, majestic place and I felt incredibly fortunate to be able to connect with the park and the group without the distractions of the modern world." "Thank you again for everything you did to plan and organize an exceptional experience. It was a trip I will never forget. When we arrived at camp on Monday, put down our backpacks and took in our view for the week, I started to cry! It was overwhelming and fantastic." "Yosemite was so incredibly magical and life-altering and amazing. Everyone there was so loving and supportive and it seemed that everyone had a really amazing experience." Also, check out our blogs about the trip HERE .